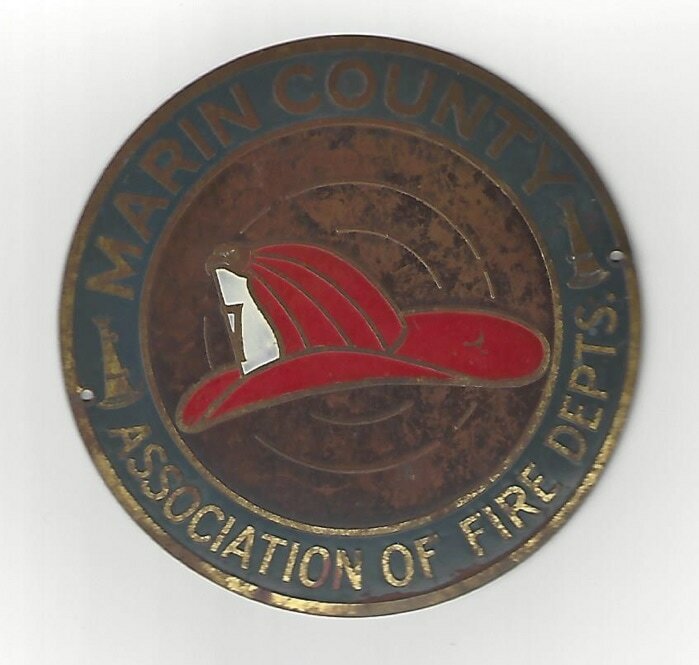 Formed "…for mutual aid and assistance to the various departments, to bring them into a closer relationship, with a central body, where matters could be discussed and acted on for the benefit of all…"
This group was in effect, the father of the current Marin County Fire Chiefs Association, formed in 1963 after the MCAFDs ended. 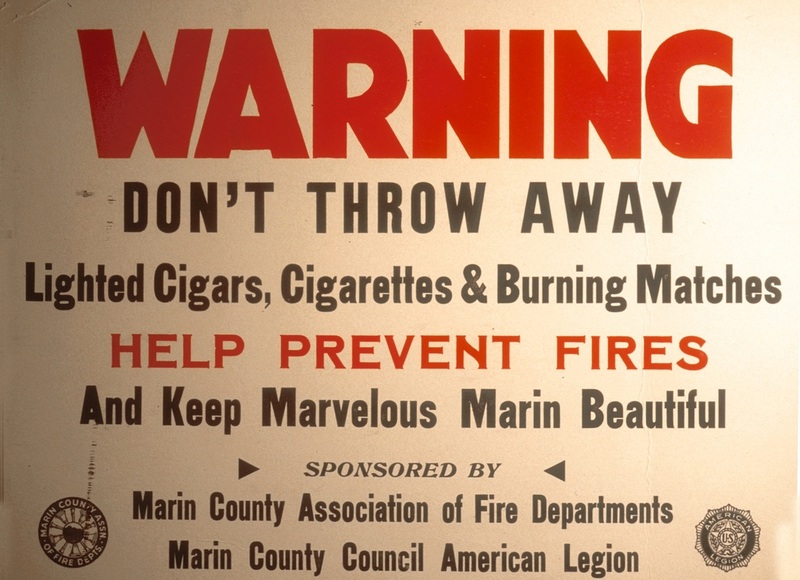 The Marin County Association of Fire Departments formally began on February 15, 1929. The founding members were the FD's of California Park, San Anselmo, and Kentfield. By the next month, Corte Madera and Mill Valley had joined, with Larkspur and Novato soon to follow. The Association was formed "…for mutual aid and assistance to the various departments, to bring them into a closer relationship, with a central body, where matters could be discussed and acted on for the benefit of all…"
A few months later, the huge Mill Valley and Mt. Tamalpais fire broke out on July 2, 1929. This massive fire required mutual aid from around the County. 117 homes were lost, but the event helped illustrate the need for such an Association. Over the next few years the group became the leader of the Marin County Fire Service. ​By November, most of the other departments had joined, and a very large meeting was hosted at the California Park FD in San Rafael. The Marin County Board of Supervisors recognized and commended the Association in May of 1930 with the formal proclamation below. Minutes of Formation, and later commendation by the Marin County Board of Supervisors, proclaiming "...this board most heartily approves and endorses the plan and purposes of the Marin County Association on Fire Departments." ​Scroll through these documents below. Thanks to retired Kentfield Fire Chief John Lando for sharing these documents from the KFD files. Marin County Association of Fire Departments Constitution and By-Laws, 1929, scroll through documents below. The general meetings of this group were rotated around the County, hosted by various member departments. Here is an example of one such installation dinner, held in 1955 in Corte Madera at the recently completed Corte Madera Recreation Center. The building was constructed with mostly volunteer labor in the early 1950's by the Corte Madera Lions Club. The Club operated the Center for many years, eventually transferring ownership to the Town of Corte Madera. The facilities included a large flexible meeting and dining area, kitchen, bar, fireplace, and elevated stage for speakers or performances. "Nearly 200 Marin County firemen, auxiliary members, their guests, and visiting dignitaries from all around the Bay Area were present Saturday evening in the Corte Madera recreation hall when Robert Greeley, Captain of the San Mateo Fire Department and President of the California State Firemen's Association, installed officers for the Marin County Association of Fire Departments, and Mrs. Vuokko Sutton of Berkeley, president of the State Ladies' Auxiliary, installed the Ladies' Auxiliary Officers of the Marin association. State President Greeley first presented retiring president Rico Marchesio of the Ross Fire Department with a past president's pin and then proceeded to install the incoming officers who were: Robert Cortelyou of Fairfax Fire Department, President; Robert Busher of Novato Fire Department, first Vice President: Frank Martinez of Homestead Valley Fire Department, second Vice PresIdent; Herb Lane of Fairfax Fire Department, Secretary; Anton Schunk of Fairfax Fire Department, Treasurer; James McConnell of Kentfield Fire Department, Sergeant-at-Arms, and Robert Williamson of Tiburon Fire Department, Property Clerk. Mrs. Sutton, after making a presentation to Mrs. Robert Morehouse of Kentfield who retired as president of the Marin County Ladies' Auxiliary, installed Mrs. Carl Heynen of Alto, president; Mrs. Ed Kothgassner of Corte Madera, vice president; Mrs. Don Denton of Larkspur, secretary; Mrs. Frank Nelson of Corte Madera, treasurer; Mrs. Frank Machado of Alto, marshal; and Mrs. Frank Evansco of Larkspur, Mrs. Charles Ravani of Fairfax, and Mrs. Morehouse, trustees. Past President George W. Hall, acting as master of ceremonies, presented Mrs. Rose Denton, past President of the Marin County Association of Fire Departments Ladies Auxiliary and a Vice President of the Ladies' Auxiliary of the California State Firemen's Association, who in turn introduced the various Auxiliary dignitaries and directed the Auxiliary installation. An impressive part of the program was the presentation of a complete outfit of fishing tackle and a fishing permit to James S. Peters, former general manager and chief engineer of the Marin Municipal Water District. The gift was in appreciation of his cooperation and assistance to County firemen during the years he headed the Water District. A delegation from the Water District including William A. Marcus and Dr. Leo L. Stanley, members of the board of directors, Mr. and Mrs. R. J. “Bob” Brusatori, and Mr. and Mrs. Louis J. Stefani, were present for the presentation. Another very impressive presentation was made by Corte Madera's Fire Chief Frank Nelson, who presented gold honorary life membership badges to City Assessor George Menke, and to his brother William Nelson, both of whom have been active members of the Corte Madera Volunteer Fire Department for over twenty years. A special helmet was presented to Charles Ravani of Fairfax as one of the outstanding "fire eaters” of the county fire service. Among the other visiting dignitaries who were introduced were William S. Hayes, Engineer of the Board of Fire Underwriters of the Pacific, and E. C. Adams, District Engineer of the Board of Underwriters; Deputy Assistant Chief Noe Chanteloup of the San Mateo Fire Department; Harvey Gruber, director of the Northern Area California State Firemen's Association. Corte Madera's Mayor, Don O'Neill, welcomed the guests and Councilmen Ruth Ross and Councilman Harry Cooper were introduced. Music, entertainment and dancing were enjoyed through the balance of the evening. Fifteen departments, four public utilities, and seven past presidents of the Association answered the roll call at the opening of the meeting."